This is a cross-post from Left Foot Forward. The brilliant Guardian op-ed by Jonathan Freedland ends with the above words. This week, in attacking Ralph Miliband, the Daily Mail invoked an age-old antisemitic smear about disloyal Jews. Whatever their intention, we need to be outspoken in our intolerance of this kind of offensiveness. The accusation that Jews have dual loyalties is not new. In 1884 Alfred Dreyfus, a French Jew whom like Miliband served his country, was put on trial and convicted for treason. Eventually exonerated, the affair divided France and inspired the political Zionist movement. Accusations of dual loyalty also feature heavily in the Protocols of the Elders of Zion, the discredited antisemitic myth which was used extensively by the Nazis. More recently at home, we had the former ambassador to Libya, Sir Oliver Miles, questioning the propriety of having Sir Lawrence Freedman and Sir Martin Gilbert sit on the Iraq war inquiry panel because of their Jewish heritage and ‘Zionism’. Within our Party, Paul Flynn questioned Matthew Gould’s ability to represent Britain to Israel because he is Jewish. Abroad, the accusation of dual loyalty has also taken root, in political parties in Poland, Lithuania and Latvia. A document referred to as the Prague Declaration was in recent years working its way through email accounts at the European Parliament. The document used legitimate concerns about communist regimes as a cover for the re-writing of history books to draw equivalence between Soviet Communism and Nazi Fascism. The perverse outcome of this and the related accusation of Jewish complicity in Soviet rule led, in Lithuania, to three Holocaust survivors being subject to state investigations for alleged ‘war crimes’. This narrative was imported into this country by, among others, Lee John Barnes of the BNP, whom in his blog depicted the Holocaust as a defensive action against ‘Jewish Bolsheviks’. The impact of the Mail attack has consequences in countries like Lithuania, where Rachel Margolis, a 91 year old partisan war hero, is now vilified by some in high authority for being a Communist. The attacks, on her and Leonardis Donskis, an MEP, are unambiguous: “Jews are Communists and Communists are evil; when we helped the Nazis we were fighting evil Communists; oh, and by the way anyone who speaks Russian cannot be a patriot and look, the [tiny and elderly] Jewish population in Lithuania speaks Russian. Therefore we cannot trust the Jews”. It is an industrial rewriting of history in Eastern Europe to excuse mass murders carried out on behalf of the Nazis. 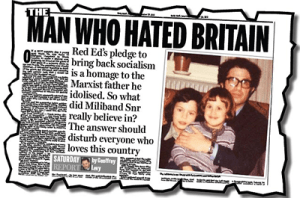 The Mail vilification of Ralph Miliband has consequences beyond his family and beyond Britain. As chair of the All Party Parliamentary Group (APPG) against Antisemitism, I challenge any hint of any antisemitic imagery being used in my own party. That is why I raised at the highest levels in the party and publically, including at the 2009 London international Conference on Antisemitism, my concerns about the depiction of Michael Howard as Fagin in national Labour Party 2005 election posters. It is not a populist move to criticise your own Party and its election material. I am pleased to say that when Paul Flynn made the dual loyalty accusation against Matthew Gould, Ed Miliband acted decisively and Flynn subsequently apologised. So too, when Tory politician Andrew Turner accused Israel of using Nazi tactics in Westminster Hall, David Cameron rightly forced him to apologise; when David Ward was abusive about the Jewish community, he was disciplined by Nick Clegg. This is in keeping with the London Declaration on Antisemitism that the political leaders have signed which states that: “Parliamentarians should speak out against antisemitism and discrimination directed against any minority, and guard against equivocation, hesitation and justification in the face of expressions of hatred”. Whether these individuals maintain their innocence or not, the parties were not prepared to allow any perception that the line had been breached. This is what is needed now by Lord Rothermere with the Mail. Their headline stating that Ralph Miliband ‘hated Britain’ was an editorial choice and their failure to apologise is an equal miscalculation. The motivations of the Mail are uncertain. The antisemitic trope might have been calculated or unintentional. Whatever its provenance, I certainly hope there was no political impetus behind this. It would be easy for Linton Crosby or his Labour and Lib Dem equivalents to set up ad agencies or others to do the parties’ dirty work. We must never tolerate anyone in any party using the racial or religious characteristics of the candidates to win seats. I will continue to challenge those seeking to do so, regardless of how unpopular that might be. On 29 October, an All-Party Inquiry into Electoral Conduct that I commissioned will publish its findings. We need clear Party agreement on future behaviour. The Ralph Miliband affair has shamed the Daily Mail, it must not be allowed to further pollute our politics. It also ill becomes a newspaper, still in the hands of the direct descendants of those who owned it in the 1930s, to publish such dubious material about a Belgian Jewish (the latter is, of course, important) refugee – written when he was 17 – when the then proprietor of the same paper had, just 5 or 6 years earlier publicly, in the same paper, praised both Mosley and his Blackshirts as well as Hitler and the Nazis. It does leave rather a nasty taste in the mouth. In the two articles below this one, I have posted comments (awaiting moderation) which elaborate on this point.